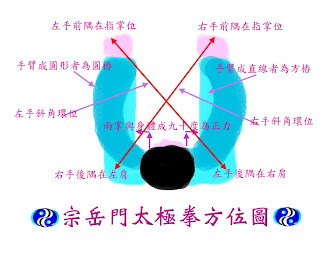 "Huan" is a specific name for a circle track that hand movement should follow in ZongYue Taichi. The huan has two different circles, one is for the right hand, the other is for the left hand. For the right hand, please check the upper picture. Raise the right hand infront of your body and keep the angle between body and hand as 90 degree. That positon is the front corner of the right-hand-huan. Keep the elbow fixed to raise the palm back to the left shoulder, back corner of the right-hand-huan. Keep the palm move down and back to the front corner. The whole circle is the right-hand-huan. 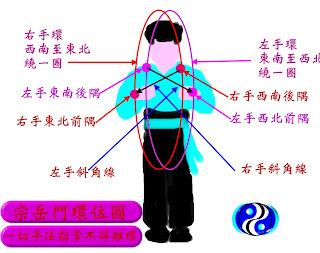 The left-hand-huan is move between left hand raise and the right shoulder. When you know the correct movement of huan, people could use that for a continued circle to move our hand to punch or to lead the oppoment's attack. For the movement, it's hard to describe, but easy to show. Please come and see.